If global temperatures rise more than 2 degrees Celsius — the ambitious goal encapsulated in the Paris Agreement — they'll have risen beyond anything the Earth has experienced in the last 3 million years. That's according to a new modeling study published Wednesday in Science Advances. The study also suggests that the present-day atmospheric carbon dioxide concentrations of more than 405 parts per million are "unprecedented" in that time. The research, led by Matteo Willeit of the Potsdam Institute for Climate Impact Research, focuses on climatic changes throughout the Quaternary Period, the most recent geologic period in the Earth's history. It extends from the present day to about 3 million years into the past. Analyses of ancient sediments, collected from the ocean floor, show that the Quaternary has been characterized by periodic swings in the climate, marked by the cyclic growth and retreat of ice sheets across the Northern Hemisphere. During the first half of the Quaternary Period, these swings typically occurred about every 41,000 years. Starting about a million years ago, the shifts have spaced out to a 100,000-year cycle. The researchers were interested in investigating some of the drivers behind these climate swings and the reason for the relatively sudden shift in their spacing. "[T]he ultimate causes of these transitions in glacial cycle dynamics remain debated," Willeit noted in a recent blog post explaining the new research. Scientists have suggested the causes may include changes in atmospheric carbon dioxide concentrations, changes on the Earth's surface affecting the behavior of the ice sheets — or combinations of both. 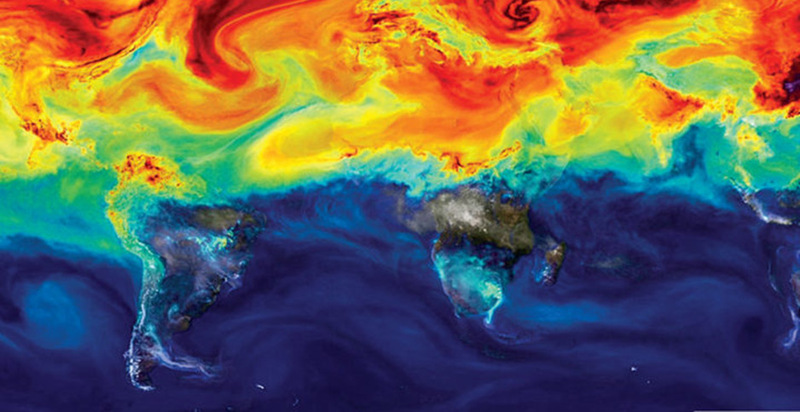 In the new study, the researchers conducted a series of simulations using an Earth system model. It's designed to capture the behavior of the oceans, atmosphere and ice sheets in response to factors, including carbon dioxide concentrations and shifts in the Earth's orbit. Rather than running a single model simulation of the past 3 million years, the researchers ran a series of shorter simulations covering various segments of time in history. Together, the simulations covered the complete Quaternary Period. The researchers say it may be the first time a series of simulations covering such a long period of Earth's history has accurately captured the climate changes indicated by ancient sediment records. The findings suggest that both changing carbon dioxide concentrations and changing landscape features have been key drivers of climate change and ice sheet behavior over the past 3 million years. If the simulations are accurate, a gradual drop in atmospheric carbon dioxide concentrations around the start of the Quaternary Period helped trigger the growth of ice sheets across the Northern Hemisphere. That started the cyclic pattern of glacier growth and retreat. Over time, the movement of the ice sheets began to erode away the sediment layer beneath them. This changed the amount of friction between the glaciers and the bedrock, and also likely produced clouds of dust that darkened the surface of the ice and caused it to absorb more heat. Both of these factors would have altered the rate at which the ice melted and moved. Together, these factors seem to explain the climate shifts scientists have recorded from the past 3 million years. That gives researchers better insight into the kinds of factors that can affect large-scale climatic changes across the surface of the Earth and how to best represent them in models. They also provide some important context about present-day climate change. The simulations indicate that across the entire last 3 million years, carbon dioxide concentrations never rose any higher than their current levels. And the results suggest that, despite many up-and-down fluctuations in global temperatures during this time, the climate always stayed within 2 C of the preindustrial threshold that scientists now use as a benchmark against modern climate change. The findings confirm that the planet's current trajectory is probably unlike anything it's experienced in millions of years. Failure to meet the Paris Agreement's targets will not only significantly alter the climate humans have been accustomed to in the recent past, the researchers write, but will push the globe "beyond climatic conditions experienced during the entire current geological period."